TWO new preclinical imaging systems from Bruker are designed to facilitate novel translational research into the causes, progression, diagnosis, and treatment of disease. 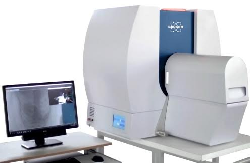 The SkyScan1276 microCT (X-ray micro-computed tomography) combines high resolution with speed and accessibility to advance improved in vivo scanning of small laboratory animals and of in vitro biological samples in preclinical studies, says the company. It offers continuously-variable magnification, with a smallest pixel size of 2.8u and scanning cycle of as little as 3.9 seconds, giving researchers access to high-quality images at high throughput. The SkyScan 1276 is said to be the first in vivo microCT system with rapid helical scanning. It uses ‘InstaRecon’ to reconstruct images up to 8000×8000 pixels per slice, and offers the ability to view and share images on any iOS or Android device. Bruker has also launched its silicon photomultiplier (SiPM) PET insert for simultaneous PET/MRI (positron emission tomography / magnetic resonance imaging) investigations in mice and rats. This insert is compatible with MRI systems up to 15.2 Tesla, allowing simultaneous measurements for the correlation of PET and MRI data in space and time so researchers can examine tracer kinetics, therapeutic agent distribution, and animal physiology. Described as a work-in-progress, this new PET insert has been successfully installed in a 7 Tesla 30cm magnet in a Bruker preclinical MRI system at the University of Leuven, Belgium, under the guidance of Dr Christophe Deroose, professor of nuclear medicine.